Everything you need to know about visiting the ancient Incan Ruins. Undiscovered until 1911 by archeologist Hiram Bingham, the most iconic work of the Incan Empire, Machu Picchu was built around 1450, but abandoned during the Spanish Conquest. One of the 7 Modern Wonders of the World, Machu Picchu is an incredible and breathless experience which leaves you mesmerized at the history behind it. Getting to this site can be a bit complex though, so keep on reading to find out more about visiting this incredible place! The sun rising over the Andes surrounding the Citadel. There are tons of options when it comes to hiking the Inca Trail to Machu Picchu, as well as hiking other trails in the surrounding Cusco region with Inca Ruins. These treks can be anywhere from 2-8 days, so it depends on how much hiking you want to do/how much money you want to spend. 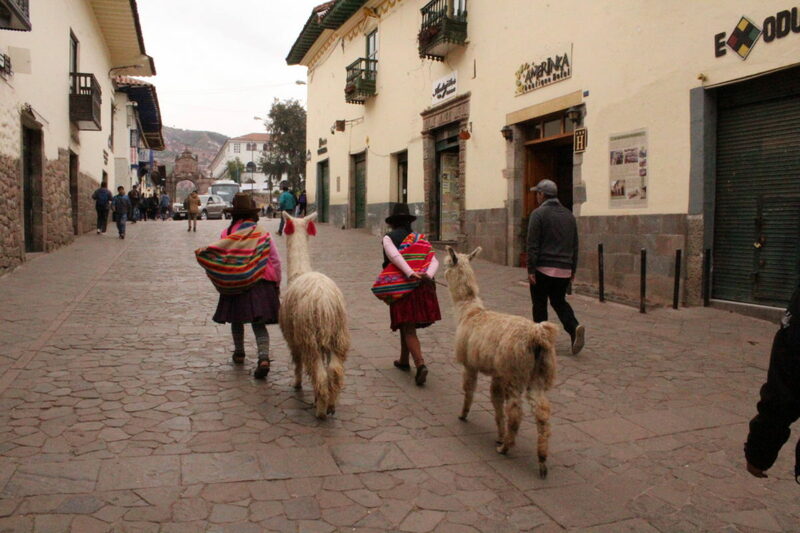 While in Cusco there are tons of agencies to book through, as well as people on the street that will hawk you down and try and get you to book, it can actually be a little overwhelming. Save yourself some grief and do a bit of research beforehand on what companies are good to book with, who is reliable, and what is included! From there just haggle your options down! Not really up for a 4-day hike (I really like being able to shower tbh), I chose the path of taking the train the day before my visit to Machu Picchu. We left from Cusco (the only station is Poroy Station), which is about a 25-minute drive from the city center and cost around 30 soles. There are two train companies you can use to get to Aguas Calientes, Peru Rail (my choice) and Inca Rail. There are three types of train, the basic, the Vista Dome, and the Hiram Bingham. The “Vista dome” was the option we picked which cost about 80-100 USD per direction, so around 200 total. To be quite honest it was worth it to take the step up from the basic option. The Vista Dome train is nice with comfortable ~reclining~ seats, huge windows on the sides and above you, and only on average $10 more per direction than the economy train. On this train you can only have one 11 pound bag, so pack lightly. They feed you food and drink included in the price, and on the night train back the following day after visiting Machu Picchu when the sun goes down and there is nothing to see, the train staff put on a dance performance and an Alpaca Clothing Fashion Show. It was really quite fabulous. The next train up is a HUGE gap, called the Hiram Bingham and cost over $400 USD, which was crazy. It looked super nice and if I had the money I might consider taking it, but it didn’t look that fancy to me. Regardless, Vista Dome to Aguas Calientes is the way to go! You leave early in the morning, ride a bus for 6 hours, get to the ruins Midday, leave. 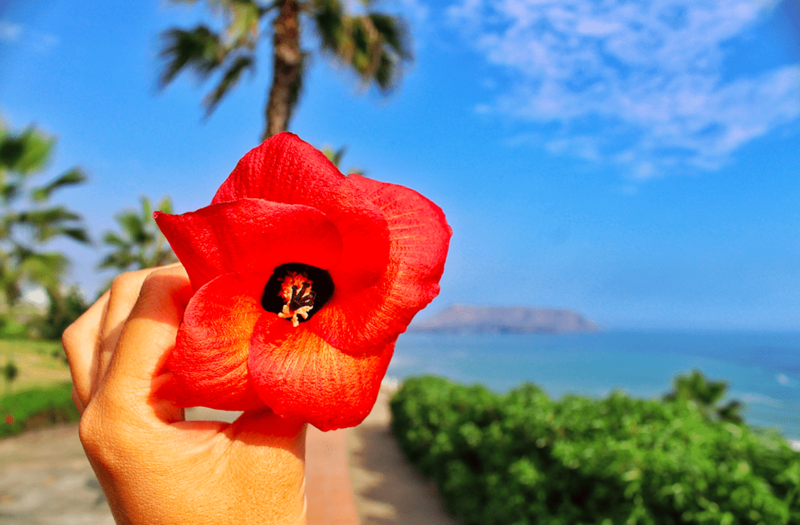 There are also two-day trips with buses you can take and different ways to get there. When you get to Cusco ask your hostel, these are probably the cheapest way to get to Machu Picchu, though possibly also the least rewarding. Unless you’re hiking in from the Inca Trail, you are most likely going to stop into Machu Picchu Town, otherwise known as Aguas Calientes. Let me forewarn you THERE IS NOTHING TO DO HERE. There are some pretty sketchy thermal baths that we did not attend due to a good call by a friend. All of the restaurants, minus one we ate at twice called Mapacho, are tourist traps and we are pretty sure we barely dodged food poisoning from our first dining experience. There are plenty of places to stay (only stay one night- the night before you visit the ruins), and instead of carrying all of our stuff up to the mountain we left toiletries and the like in storage. Once in Aguas Calientes you can either take the bus up to the citadel ($24 USD) or make the hike along the train track and up the mountain (about 90 minutes). The first bus leaves at 5:30 am, and people will be lining up long before that. We got in line at 5:15 and were on probably the 10th bus but we were still up at Machu Picchu before 6 am (they let people in early). If you take the bus then there is really no hiking in the day at all, this is how thousands of out of shape people do it every day. Something important to note is MOTION SICKNESS. The bus is winding around on a dirt road up to the mountain and you can’t see very much out the windows. I don’t get motion sickness at all really, and going up the mountain I started to feel a little queezy. Trying to make the decision of if you should walk up to the citadel or take the bus? Here is my recommendation: If you’re not doing another mountain hike that day (MP Mountain or HP), the hike to MP from Aguas Calientes isn’t that bad. It’s 60-90 minutes of straight stairs, which can be a burden, but isn’t really that horrible. Most people who are hiking up to Machu Picchu leave around 4:30 am. If you are hiking another mountain that day, I wouldn’t do the first hike, because HP/MPM hikes are BRUTAL. Huayna Picchu is 2 hours of steep and narrow hiking, and not something you want to be exhausted for. 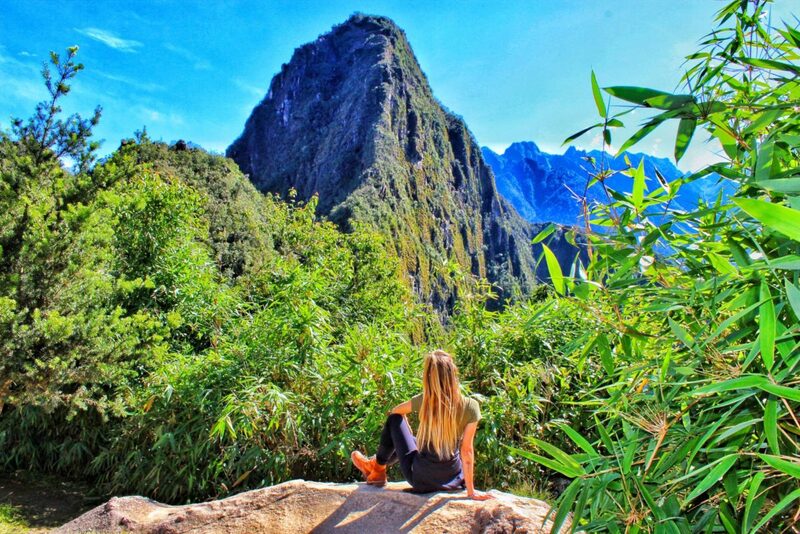 If you aren’t booking through a hiking agency, you are going to want to book your entrance tickets to Machu Picchu far in advance (a few months) to be sure you will get access to the site. Only 2500 people are allowed into the site daily. TICKETS ARE NOT SOLD AT THE ENTRANCE TO MACHU PICCHU. 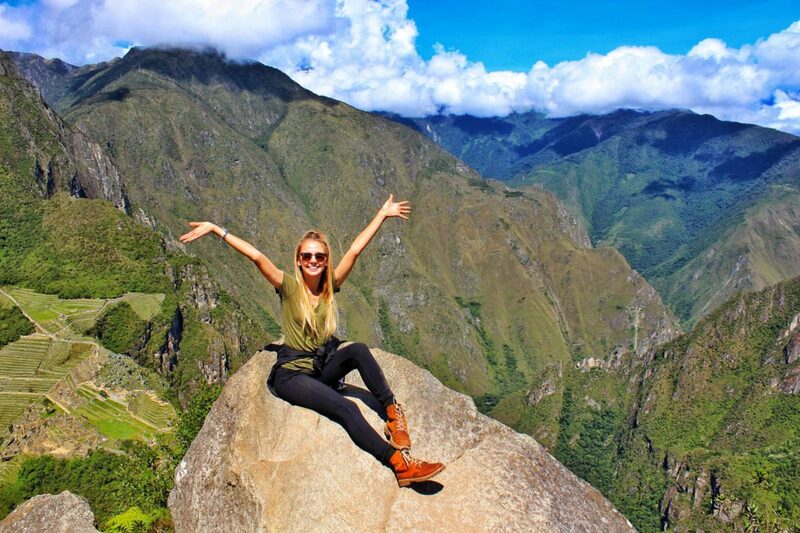 The whole booking in advance thing goes double if you plan on hiking Huayna Picchu or Machu Picchu Mountain since only 400 people each are allowed to hike those. The Peruvian website which you book your ticket on is super confusing, and a bit of a pain to use. Normally, I would never willingly send you to another site, but these guys did a fantastic way of explaining how to book and go through the process, so click this link when you go to buy your ticket and follow their booking instructions step by step…its the site that I used and the best way to get you through that process. No poles/walking sticks- they damage the site and will take them from you at the gate. Snackage- the only place to eat is right outside the park and is expensive, bring food in!! A small bag for your trash- there are no trashcans in the park! The Machu Picchu Citadel looks incredibly small from the top of Huayna Picchu. The important thing to remember when it comes to what to wear in Machu Picchu (and travel in general) is LAYERS!!! 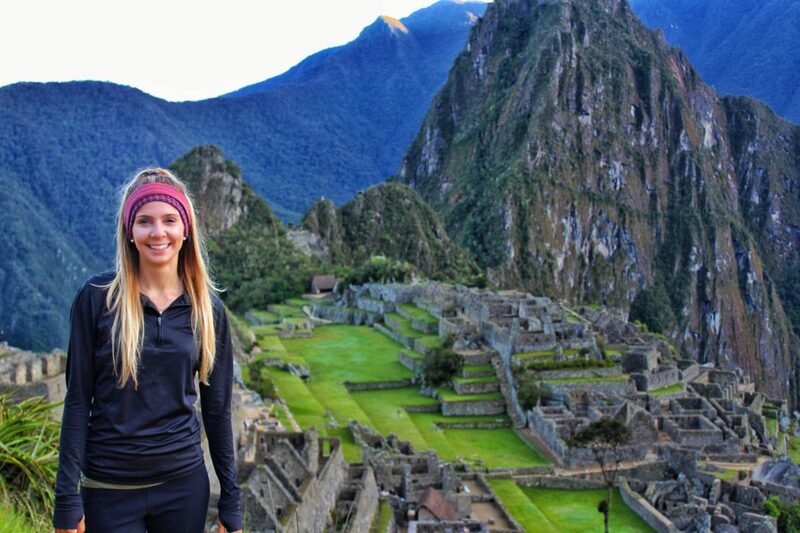 Here is a list of all the layers you should wear when doing Machu Picchu. You’re gonna get dirty. Literally covered in dirt. Even if you are doing no hiking at all, you will come back from that mountain dusty. Also, as I mentioned earlier, there are no bathrooms within the park and nowhere to eat, so make sure you are prepared for this!! Also if you are packing snacks/need to throw something out, there are no trashcans in the park so keep in mind you will have to put it in your bag. Also in parts of the park that require you to follow a path. These signs indicate a certain walkway is “one way” and are a bit confusing, but most of the day this didn’t matter. We disregarded the signs for most of the time, exploring around, but another time a guard got on to us and told us to turn around. If you want a tour guide for your solo venture you can find one in the town or at the gates, just make sure they speak your language first! Exploring in the ruins will only take a few hours, and the best time to go is in the early morning, as the lighting is stunning and not too hot, but the later in the day you go, the fewer people there will be.